Fashion Denim Lanyards For The Young's and All Ages with Western Style Cool Looks ! Great For Fashion Name Badges, Apparel Company's Fashion Matching or Promotional Giveaway Gifts. 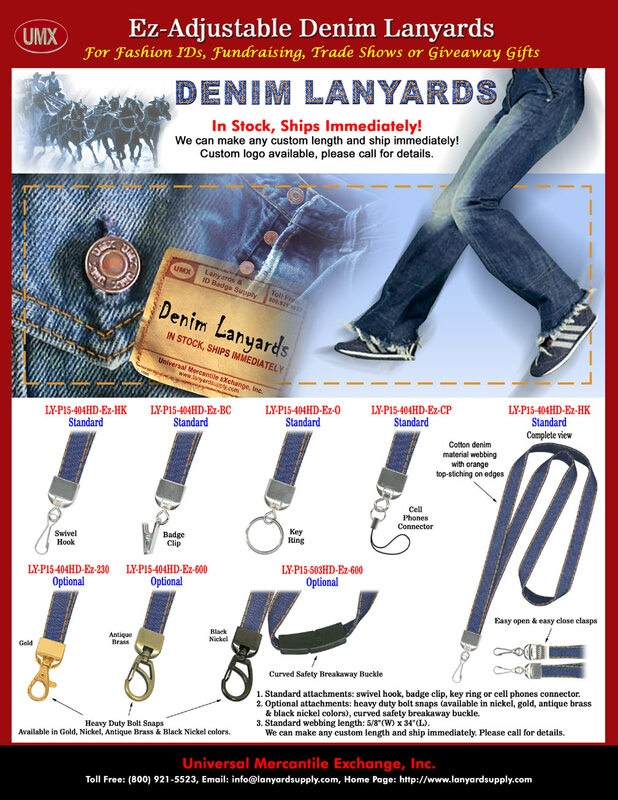 The "Cool Looks" fashion denim lanyards are made of denim (cotton) material with great fashion designs. Not only for the young's, they are designed for all ages. Our standard denim lanyards come with heavy duty nickel color swivel hooks, badge clips, key rings, or cell phone connectors. They also come with a variety of optional hardware attachments, such as safety break-away buckles, heavy duty nickel color, gold, antique brass or black nickel color snap hooks. 1. Standard Width of Lanyards: 5/8". 2. Standard Length of Webbing/Straps: 34". Optional Length: Any custom length available, like 12", 14",18",20",22",24",32",36",42",48" and more. 4. Standard Colors of Webbing/Straps: Blue Jean Color. Optional: Any Pantone PMS colors with a minimum order of 5000 pieces or more. 5. Standard Hardware Attachments: Metal: Ez-Adjustable nickel color: swivel hooks, badge clips, key holder rings or cell phone connector. 7. Way of Patterns: Denim Jean Style. 8. Custom Imprinting: Use the denim patterns as back ground. Any customized or personalized logo printed on denim lanyards available. Kids party for fun, fundraising for event fundraisers, promotional giveaway, gifts, zoo's gift shop resale stores, or for small business fashion ID name badge holders. 10. Minimum Order: 1 Pieces/Per Color, Per Style. Small Minimum Order: Good for Personal Use or for Small Business ID name badge holders. You are viewing Lanyards > Ez-Adjustable Neck Wear Models > Fashion Denim Lanyards For The Young's and All Ages with Western Style Cool Looks !